Yesterday I saw Cookie A attempt to explain the Axiom of Choice to room full of knitters. One of my life's Great Missed Photographic Opportunities was my failure to snap her picture drawing the Cantor set underneath a knitting diagram. 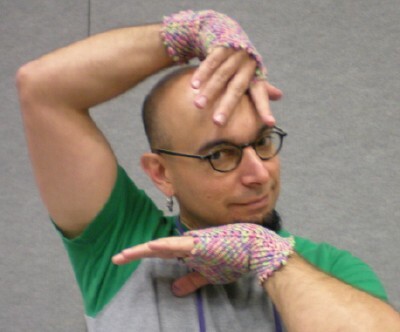 Demonstrating that I occasionally learn from failure, I offer you Franklin Habit wearing my Oblique fingerless gloves. Okay, I think I've successfully ordered business cards to pick up later this afternoon. The hotel wireless was too slow to handle emailing a big attachment, so I had to sneakernet the file downstairs to the business center and use webmail. Let's hope it went through. I really do need them here. Just this morning I talked to an indie dyer who would be interested in sending me some of her yarn for a Skew sockitecture-based design and an Ohio knitting guild program chair who invited me to give a workshop. Well, bother. I've got another hour before my alarm, but my sleeping pill wore off. I'm always too excited too sleep unaided at these events, and I only get six hours' help from a pill, so that leaves me about three hours short. I guess I need to add a bottle of anti-redness eye drops to my travel supplies, so I won't look like I followed up a hard day of knitting with a hard night of drinking. Today's agenda: a morning class with Cookie A, and an afternoon trip down toward the Capitol building to see if the independent printer can crank me out a small batch of business cards. In between, I'd say lunch at North Market is a strong possibility, including a salty caramel ice cream sandwich from Jeni's (yesterday I had the orchid vanilla sandwich, which includes a marvelous layer of tart black currant filling). 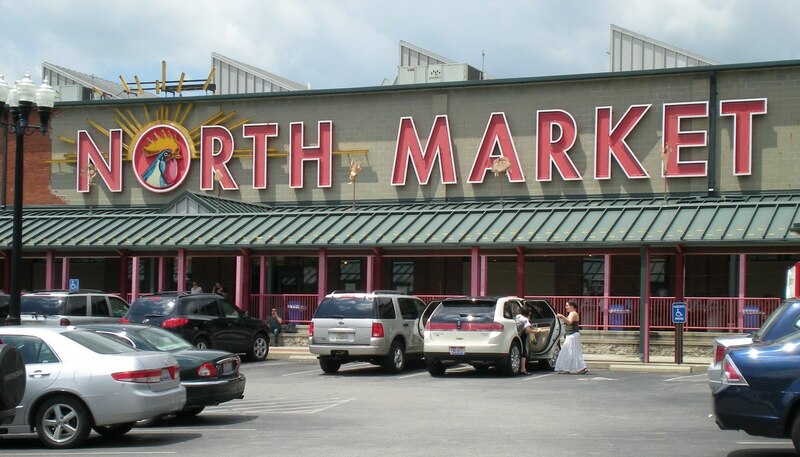 North Market reminds me of Faneuil Hall in Boston: you can just eat your way down it from one end to the other. You can get Indian, Vietnamese, Mediterranean, sushi, crepes (savory or sweet), fine chocolates, pastry, or gourmet ice cream. And those are just the places that caught my eye! I don't think I'll be needing to spend a lot more time in the Knitter's Market, though. I covered it pretty well during last night's preview session. Unfortunately, it's a lot smaller this year. Last year, the exhibitors were split between two rooms, one of which was distinctly less desirable than the other. It wouldn't surprise me if a number of the exhibitors who were stuck in "the Cave" decided not to come back this year (I know that's the case for one of my favorite indie dyers). I did make a beeline for the Briar Rose booth, though, to snag a couple of skeins of limited edition teal merino/silk laceweight. I'm going to see if I can doze a bit before breakfast and Cookie. I'm in a hotel room sipping on a hot beverage vaguely resembling coffee, waiting for registration to open at Knitter's Connection. I've got design classes with Ginger Luters all day: modules in the morning and short rows in the afternoon. Although being solely responsible for the hotel bill is going to be grim, I'm enjoying having a room to myself. Since I have both a husband and a housemate at home, I don't get a lot of truly "alone time." And since I have some income to offset, at least the expense will be tax deductible. It's been a long time since I took a car trip by myself, too. While it's awfully nice to ride in the passenger side and knit, it's also pretty cool to have sole control of the radio dial. And I get to decide when it's time for a Starbucks stop. Or whether to take a semi-gratuitous detour through the Dayton metro area. (I say only semi-gratuitous because I was looking for an office supply store. I successfully acquired a graph paper notebook and possibly the most fabulous set of colored pencils in the world, but it was too late in the day to get business cards printed.) This would have been more brief if I had remembered to pack our Ohio map. My late departure, as well as my failure to get business cards printed, was due to a frenzy of mad knitting and proposal preparation for yesterday's submission deadline. I'm terribly proud of this project; it's a triumph of short row geometry. I wish I could post photos! If it doesn't get accepted this round, I've already got a Plan B. It's almost eight o'clock, so I guess it's time to pack up my colored pencils, my modular beret, and my mystery short rowed object, and head over to registration.